Grams Performance Fuel Filter UNIVERSAL - Pann Auto Performance - San Diego largest aftermarket automotive performance parts - What do you drive? The compact aluminum casing design of our fuel filters paired with an element which filters 100 or 20 microns is sure to provide a fuel injection solution to keep your system flowing freely with minimal pressure drop. 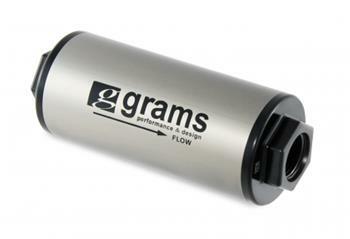 Grams fuel filters keep your injectors and engine uncontaminated and functioning at peak performance by filtering out dirt, rust or other foreign particles. PRO TIP: Contamination is the number one killer of injector performance. For the ultimate fuel injection protection, install the 100-micron filter before the fuel pump and the 20-micron filter after. Filtering the fuel before and after the fuel pump will ensure greater protection for your fuel injection system and safeguard to your injectors.